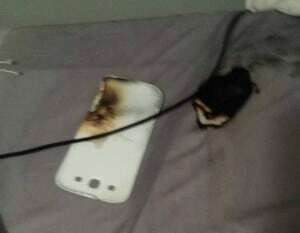 Nasty news about Samsung Galaxy S3. A customer has posted on Reddit that his devices exploded when it was charging. The customer says that he woke up in the night when he heard a weird noise. Also, he is saying that his phone was smelling really bad. Then, the device was really on fire and the customer put a glass of water on it to stop causing any damages. He uploaded some pictures on the internet to prove that he is not telling stories about this. Also, he put a photo of his pillow which was in a really bad shape because of the melted plastic which was shoot out from the device. The customer suffered a little injury because of the melted plastic which burned his skin. The device was originally equipped and it was let only an hour plugged for charging. Also, he said that he made no modifications to the phone and he is disappointed about the accident. He declared that he is thinking to send the case for instances to judge it and maybe obtain some money from the big company. There are a lot of comments about this incident on the internet and you can comment and give your opinion about it. All in all, this is a singular case and if you are a customer of Samsung, you should not be afraid about a similar case. Just enjoy your Samsung devices.